Right in the heart of Denver, in the lands near the Stapleton airport, there’s an urban farm of 150 Acres. Students of the University of Colorado from Denver, built these two tremendous projects to improve the productivity of the farm and also create a symbol of sustainable architecture as a part of the FEED program from Denver. Using mostly recycled materials (wood pallets), the team built a shelter and a place to milk the farm animals with a high architectural design. This project led by the most representative heads of “Studio HT” as a part of a class of the “Design Build Program” of architecture at the University of Colorado at Denver. The “Learning Cube” is a simple wooden structure created with interlocking wooden pallets. While the materials are rudimentary, the design is clean and made of simple lines, refined. The piece of construction is a meeting point for knowledge exchange, production, and protection from the Colorado sun. The “Dairy House” is a refined construction made of a mix of recovered materials: such as stone, iron, wood (pallets), to provide a nice and stylish place to milk the goats. The steel gabions contain demolished concrete to hold the outboard seats. A bar to tie the animals and a milking platform completes the functions of the building. The architectural design speaks for itself and permits the work. This is a message for everybody of how you can join the economic productivity and the ecological architecture with a good design. 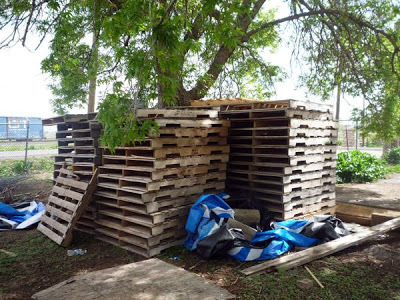 Do yo like this DIY pallet furniture project? Do yo want to look for more DIY pallet houses and pavillions?